I recently came across Rod Serling's introduction to his 1957 book 'Patterns' (h/t to the interesting piece The Enduring Legacy of The Twilight Zone by Brian Murray). This article is a must-read for screenwriters, and a good read for anyone with creative pursuits. "It’s axiomatic that the beginning free-lance writer must have some sort of economic base from which he operates. Usually it is a job with at least a subsistence wage to give him rent money and three square meals a day while he begins the treacherous and highly unsure first months of writing on his own. The most desirable situation encompasses an undemanding job that draws little out of the writer’s mind during the working day so that his nocturnal writing will be fresh, inspired and undiverted. In my case this was a wish but never a reality. I used to come home at seven o’clock in the evening, gulp down a dinner and set up my antique portable typewriter on the kitchen table." It is always good when you pay the rent. This reminds me very much of Faulkner's sentiments in his interview with The Paris Review, where he discusses the various day (or night) jobs that provided subsistence while allowing mental freedom. "I was either going to write dramatic shows for television, even at the risk of economics and common sense, or I was going to succumb to the double-faced sanctimony of commercial radio, rotating words as if they were crops, and utilizing one of the approaches so characteristic to radio-writing and thinking downward at the lowest possible common denominator of an audience. That afternoon I quit the radio station." He doesn't mince words here, and it is clear that his daytime work, while in the writing profession, was unsatisfying. "All she did was to take my hand. Then she winked at me and picked up a menu and studied it. And at that given moment, the vision of medicine bottles, girl yodelers, and guitar-strumming M.C.s faded away into happy obscurity [these were things he had to write copy about]. For lush or lean, good or bad, Sardi’s or malnutrition, I’d launched a career." 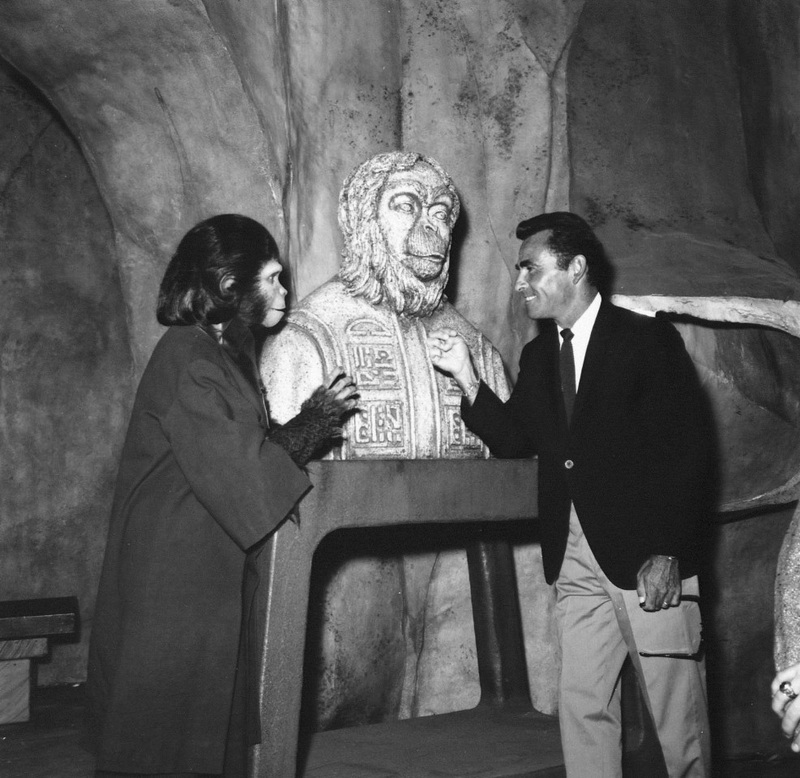 Rod Serling on the set of 'Planet of the Apes' (1968), which he co-wrote. "The motion-picture industry looked down at its newborn cousin somewhat as the president of a gourmet club might examine an aborigine gnawing a slab of raw meat. The movie people had no way of knowing at the time that this bumbling, inexpert baby medium would one day compete with them and come dangerously close to destroying them." While I love contemporary films on the festival circuit and continue to work through my own watch-list of old films, I find myself being drawn to television content more and more. I haven't been to a blockbuster outside of Star Wars and Blade Runner 2049 in a few years, and most of the screenings I find myself going to are repertory ones. Quality can be found everywhere, but it seems original television (if you can still call it that now, given streaming) content is more consistent. Serling then describes the early years of his television career (early 1950s) and how the television writing profession slowly gained clout. 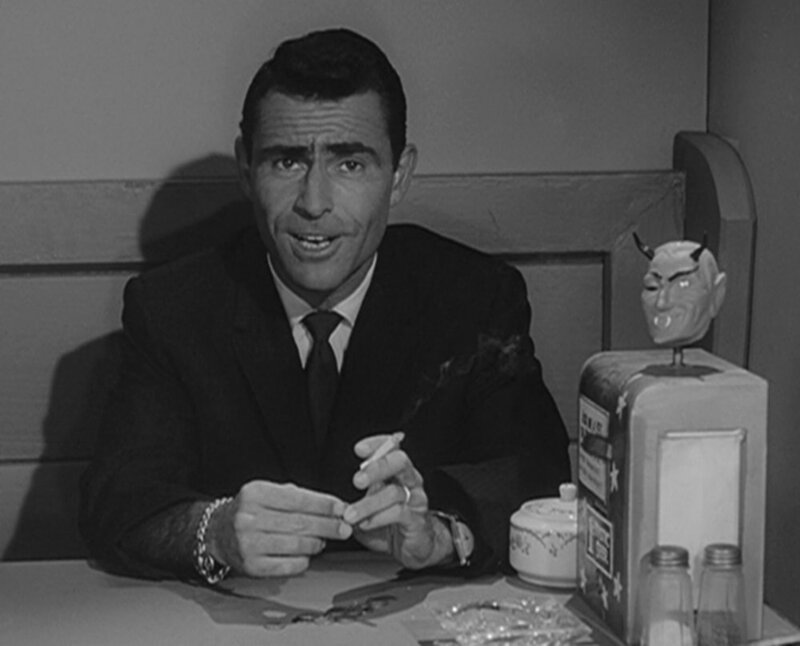 It is crucial not to understate Rod Serling's influence on the craft of television writing. 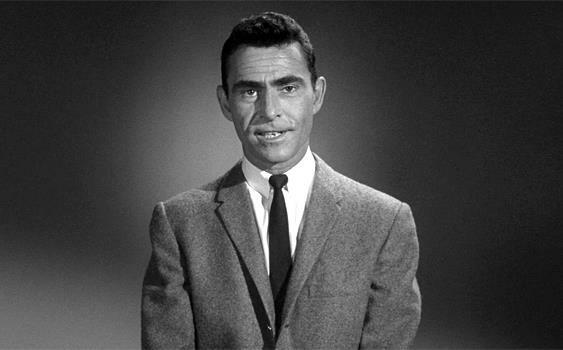 The Twilight Zone, while one of my biggest influences and hence a slight source of bias, pioneered advanced thematic storytelling within the confine of small screens, commercial breaks and short run-times. I'd encourage you to watch the old episodes on Netflix, and tune into SyFy's marathon every July 4th and New Year's Eve/Day - you'll be surprised just how good, and culturally relevant (in a human, thematic sense), the series is. Rod Serling introducing 'The Twilight Zone' episode "The Nick of Time," starring William Shatner and Patricia Bresling. "...[t]he major advance in the television play was a thematic one. The medium began to show a cognizance of its own particular fortes. It had the immediacy of the living theater, some of the flexibility of the motion picture, and the coverage of radio. It utilized all three in developing and improving what was actually a new art form. [...] [T]he television play was beginning to show depth and a preoccupation with character. Its plots and its people were becoming meaningful. Its stories had something to say." Further in the piece, he gives anecdotes on writer's block, feeling out of place, what it's like to "cross the Rubicon" of success, and the personal rewards of being a creative. There is also much explanation on the medium of television, including censorship and commercialism. Read it here. "The physical and the fates conspired to force the maturing of the television drama. It was no longer a novelty; it had become a fixture. As such it competed with every other kind of entertainment; consequently it was forced to become better, to become different, and to aim higher. It was a medium that in a one-hour time period could play to an audience greater than a Broadway play reached in one solid year of SRO crowds. With this kind of potential and with this kind of impetus, however young, however groping, television was something to be reckoned with. But there is still time and there are still ways." Those ways seem to be in the lead. 'TV Legacy: 'Mad Men' creator Matt Weiner and the cast of the show. Serling on commercials: "I don’t really believe there exists a 'good' form of commercial. There are some that are less distasteful than others, but at best they’re intrusive." Image via Wikipedia. TV Legacy: David Chase, creator of 'The Sopranos,' and the late James Gandolfini. Image via the Daily Beast.